Halloween – Try not to scare us too much with your spookiest dish. Hallelujah, it’s Halloween! Or, more accurately: Hallelujah, it’s the last day of VeganMoFo — a fact for which I’m embarrassingly thankful. Man, this has been a tough month. While I wouldn’t say I’ve been phoning it in, per se, I definitely haven’t given 100% this year. Seven new recipes, a few half-recipes/half-templates, and a bunch of round-up posts would be quite (!) productive for a normal month, but are maybe a little lackluster for VeganMoFo. Next year, I think I’ll come up with my own theme. It’ll give me more time to prepare and free me from the prompts that didn’t inspire me. Hindsight! Anyway, on to Halloween. I didn’t dress up this year, for a variety of reasons, but I did get to enjoy a whole lot of treats at work. An enterprising new employee arranged a staff party, complete with be-costumed dogs and a vegan potluck! (Perks of working for an animal welfare organization.) I wanted to snap a few photos of the spread, but the room was dim (you know, to enhance the the spookiness) so here’s a photo of my plate instead. That vegan buffalo chicken dip on the right might be a bit visually unappealing, but it was insanely good! Rich, creamy, and a total indulgence, but yummy with celery dippers. I also loved the mini Almond Joy bites on the top left. And I wish I’d gotten a photo of that orange cake — one of our talented coworkers made a vanilla cake decorated with orange frosting and black piped spiders and spiderwebs. She also made a chocolate cake frosted to look like a gravestone. What did I contribute to this massive table of vegan treats? Absolutely nothing. Frankly, my reserves for non-essential cooking are at an all-time low. (And actually, Steven has taken over the essential cooking to give me a break.) Plus, we were downtown last night at a panel discussion on the changing face of American journalism, and we didn’t get back till nearly 10pm. No time to whip up anything! I usually always contribute to potlucks and other group meals, so I didn’t feel bad not doing so this time. Instead, I just enjoyed the food. And with that, I bid adieu to VeganMoFo 2017. Time to hand out vegan lollipops to the trick-or-treaters! 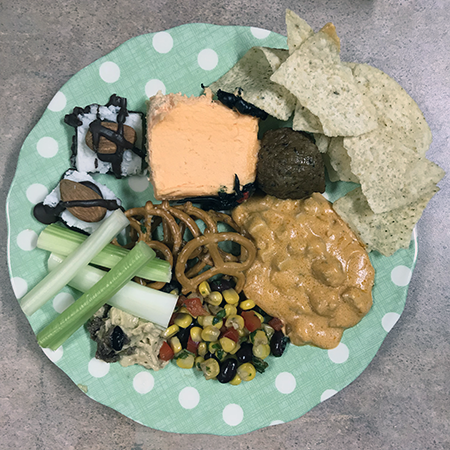 A vegan potluck at work! You’re so lucky! I’ve really enjoyed your posts, so I hope you’re not too disappointed with your efforts. I was awful at Vegan MoFo this year! I blogged a lot but didn’t feature anything amazing that I made to follow the theme. I’m new to your blog but am loving it! Hope you don’t mind me linking and visiting often!